Note: This is a logging area learning to be an entertainment and tourist area. If you have bad experiences, remember, local nerds do, too. Be a beacon for the future, and watch the geeks come out. You might find your local GIMP enthusiast - or expert on the Pacific Northwest Tree Octopus. LGBT community vibrant and growing. On the way in, you'll see a lot of places to eat along the road; they're all good. Native nations wonderful places to visit; watch out for amazing native art, including totem poles and house murals. Casinos and stores double as art-galleries. When you're coming through town, look for the Cornerhouse. Good hot breakfasts. Very logger vibe, but we got the local weirdo waitress, and she can't wait to see us again. Bottomless coffee cup. The Lazy Moon: best place for a great local beers with funny names, bar food, and the entire Conan the Barbarian collection in the reading nook. One of the waiters is into Steampunk, and that's what the clock looks like. Fairmount Motel and Restaurant: Old-fashioned diner food served right. Great prices - get the rye bread toast! Lake Crescent Lodge. If you have time, hit their gorgeous lakeside beach, and if you have a designated driver - Lake Crescent Whiskey. 117 proof, $17 a shot. SHARE ONE. Wonderful swimming - cold, but clear. Twisty roads, but all have guard-rails now. 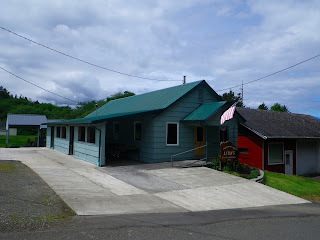 Don't miss the Joyce General Store; Part food and department store, part museum. And the Museum ain't bad, either. The best in town is at the 3 Sisters of Clallam art gallery (big green building on the west end of town), which has espresso so good you can drink it straight. The Weel Road Deli's Hole Shot Espresso Shop. All kinds of variety and treats, and a cute little corner. Strait Shots. as you breeze into town. Will serve you if you're on a horse. Sunsets West Co-Op: Healthier and locally-raised food, excellent hot soups, to-go made dishes, ice cream. Lots of good things for those with dietary concerns. The Clallam Bay Inn: Beer and liquor. Ask who's serving; make sure it's Cara. If it's Edna, leave. Best fish and chips, good draft beers (Mac n Jack's and Manny's). At the Breakwater Inn, halfway to Sekiu, order Dixie's bread pudding. Decent food, nice full bar. Great view. In Sekiu, the By The Bay Café has good ol' 1950's diner food, and a pretty view. During Fun Days: Lion's Club barbecue is prime. A must: look for frybread! Local prices low, food tasty, much of it homemade. Take-Home Fish Company. THE place for dry-smoked salmon. Worth the trip. Warm House Restaurant. Nice place for breakfast, fish-n-chips, light dinners. Great eagle views.